Five states have now been affected by floods in Australia in the last month. In my earlier posts both on this blog and On Line Opinion, I have followed the difficulties faced by archives and libraries in face of natural disasters and specifically focussed on the travails of the State Library of Queensland. Now, nearly two weeks later, we can get a better picture of what has occurred and the recovery process. More importantly, there is something that we can do to help flood-affected families recover the personal photos that they have lost. The Australian Library and Information Association has listed libraries in flood-affected areas of Australia together with a brief comment on how the floods have affected these libraries. Despite the fact that a lot of flood water invaded the lower levels of the State Library of Queensland, the collections are safe. Work to protect the collections started well before the rain fell in response to long-range weather predictions that forecast heavy rains for Brisbane this summer. 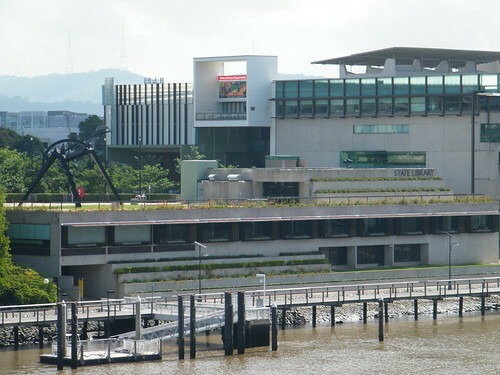 However, the cultural precinct in which the State Library of Queensland is located is still closed to the public. Previously I congratulated the library for their work in uploading 50,000 images to Wikimedia. Yet this was just a small part of the work that the library has done to secure their collections. The State Library had a comprehensive disaster plan which guided the staff during the crisis. It is hard to think of all that is needed to be done when one is engulfed in a disaster. This is made doubly hard when it is not just the workplace which is under threat but, as was the case a couple of weeks ago, the homes and family of the staff who are looking after the collections are under threat also. The State Library’s preparation is a good demonstration of why disaster plans are important. While the major archival collections in Queensland appear to be safe, not all libraries, archives and museums fared so well. Collections Australia Network has a list of affected organisations. The Australian Society of Archivists has started a register to identify damaged archives. Blue Shield Australia will then use this information to co-ordinate a recovery operation using the skills and resources of Australia’s heritage sector. Blue Shield is an international organisation that seeks to protect the world’s cultural heritage from disasters such as this. The most significant archives to be affected by these floods are probably personal archives held in homes. Many of the collections held by our state archives started off as private collections. For one reason or another they were donated to institutions and over time they become highly valued. An example of this is war diaries, photos and letters. Unfortunately much historically valuable like this will have been destroyed. However it is amazing what can be restored. If you are one of the many people around Australia trying to restore flood-affected documents, photos and books check out the Museums Australia Networks site for some good information and links. For those of us who live a long way from these disaster zones, there may be something we can do to help families recover their lost photos. Many families marked significant events such as a marriage or a birth of a child by taking photos – many photos. They then printed off copies of these photos and shared them among families and friends. While the original family records might be lost in fire or flood, duplicates of photos may be safely stored in photo albums around the country. My uncle and aunt lost all their wedding photos in a bush fire during the 1990s. I trawled through our albums and scanned my uncle and aunt’s wedding photos and any other old photos that they may have lost. I then created a scrapbook album with these photos and my mother added some handwritten memories relating to them. Sadly, it wasn’t until my uncle died that I thought of doing this, but at least now my aunt has an album through which she can remember her husband when he was young. Open up your photo albums now and see if you have photos which you can copy and give to someone who has lost so much in the floods. Spread the word and encourage others to do the same. This entry was posted in Storage of Historical Material and tagged Australia, Brisbane, Floods, History, Queensland, Storage of Historical Material by perkinsy. Bookmark the permalink.